Roofing Products and Services from Just a Quote, including Roofline Products (including PVCu soffits, fascia boards, gutters, downpipes and cladding), Roof Coatings which can transform the appearance of your tiled roof, new Tiles and Slates for pitched roofs and the various types of materials used for new and refurbished Flat Roofs. So if you are looking for a roofline quote, a roof coating quote or a complete new roof quote…you’ve come to the right place. 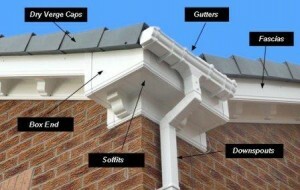 The term Roofline refers to a group of products which include soffits, fascia boards, barge boards, dry verge clips, gutters and down spouts which are fitted around the line of the roof. These products have two main functions – to protect the eaves & roof structure of properties and to take away rainwater which falls onto the roof. The vast majority of roofline products installed on new properties are wooden (soffits, fascia boards and barge boards) or plastic (gutters and downpipes), though some older properties may have had asbestos or metal roofline products originally fitted. The main reasons for their replacement with modern PVCu products is low maintenance and a more attractive appearance. Though not strictly a roofline product – external wall cladding is also fitted by most Roofline installation companies. Terms other than roofline are also used for this classification of products, such as Rooftrim or FSG which is an abbreviation of fascias, soffits and gutters. The market for applying roof coatings has grown rapidly over the past decade, it generally involves cleaning and spray painting existing roofs fitted with clay or concrete tiles and we get many visitors to this website looking for a roof coating quote. The process normally includes cleaning the tiles, replacing any damaged ones, re-pointing the ridge and other cemented areas, applying a fungicidal wash and then spraying the roof with two or three coats of a proprietary coloured sealant or paint. There is no doubt that once treated in this way, roofs with clay or concrete tiles can look much better and provide added kerb-appeal. But although there are some very reputable companies offering this service, as with many home improvement products there are also some companies which use pressure selling techniques, charge unjustifiably high prices and offer very little in the way of customer service. Whilst claims for the service include improvements in insulation it is doubtful that there are many substantial benefits beyond the improved aesthetic appearance. If you live in a house with a pitched roof rather than a flat one, you will almost certainly have a tiled or slate roof above your head. Modern tiles are generally constructed from either clay or concrete and include flat or plain tiles, pantiles, Roman tiles or more modern designs which interlock more effectively than the traditional products. Roofing slates include properly quarried slate or reconstituted products, though there are also concrete tiles which are given the appearance of slate. 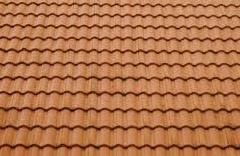 Both clay and concrete roofing tiles are available in a wide range of shapes, sizes and colours but clay tiles will last longer, look better and absorb less moisture. Though on the downside, clay tiles will also be more expensive than concrete tiles so if you are looking for a roofing quote it may be as well to check the type of tiles on your roof first. Flat roofs are constructed on both domestic and commercial properties for a variety of reasons but the lower cost when compared to pitched roofs is probably the most common reason given. With regard to commercial and public buildings, they can represent an efficient use of urban space and reasons such as architecturally aesthetic designs and the ease with which they can be employed to deal with complex building shapes are often stated. On occasion flat roofs can also provide an elevated deck for pedestrian access, as long as a balustrade is constructed around the perimeter to satisfy health and safety requirements. Bitumen felt roofs are probably the most common type of flat roof in the United Kingdom and though they are not recommended for use on habitable buildings, they quite often are. We cover the processes involved in the cold construction a flat felt roof as opposed to hot construction where hot bitumen is used. 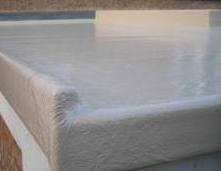 Rubber EPDM membrane is a 100% cured, single-ply roofing membrane made of an Ethylene-Propylene-Diene Terpolymer and according to Firestone™ one of the major manufacturers, it offers unique features and benefits. Since it was introduced in the early 1980’s, Firestone™ EPDM rubber roofing membranes have been installed on hundreds of thousands of commercial, industrial and residential flat roofs. Commonly referred to as fibreglass, glass-reinforced polyester was developed half way through the twentieth century and was used for a wide range of applications due to its high strength and non-corrosive properties. It was initially used in boat building – particularly for small craft such as canoes – but its relatively low weight, waterproof properties and strength led to its use for water tanks, ponds, roof lights and even body panels for cars and commercial vehicles. Its ability to be moulded to practically any shape imaginable and be constructed in situ means that it is particularly suited to providing a waterproof surface for flat roofs – new or old. Sika Roof Assured™ specialises in the installation of Sika Sarnafil™ single ply PVC roofing systems for the domestic market and although the product is extensively used for commercial roofing, most of the information in this website is tailored for the homeowner. Sika Sarnafil™ single ply PVC roofing systems can be used to replace an existing roof which is leaking, one which has reached the end of its functional life, or for new build projects. It is easy to assume that this type of roofing product is only suitable for flat roofs but Sika Sarnafil™ single ply PVC roofing systems can be used on roofs with a pitch of up to 35 degrees. 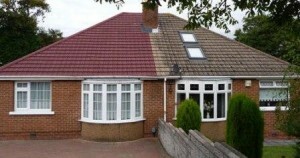 Roofing Products and Services: Too much choice? Whether you are looking for a roofline quote, a roof coating quote, a new pitched roof quote or a flat roof quote, too much choice can bring confusion. When you invite a sales representative into your home to quote for new roofline product or a complete new roof, you may be impressed by the level of knowledge they have and the care that goes into the design. What you will not get though is objective, un-biased advice because for all of the friendliness and empathy the sales representative imparts, they are there for one purpose only – to sell his company’s products, at the highest price he can get away with! Just a Quote will introduce you to up to four qualified and experienced roofing installation companies who will carry out a detailed survey and provide a free quotation for the roofing product or service you are interested in. During the survey they will listen to your requirements, show you sample products or brochures and discuss the many options which are available. You should ask for a written quotation, not an estimate, which details the full extent of the work being carried out, together with the payment terms.